A small multi-trunked tree, Decaisnea rarely exceeds 5-6 meters in height, with a similar spread. The bright green pinnate leaves, which can be as long as 90cm (3ft), emerge in mid-spring. The pendent panicles of blooms, up to 45cm (18in) long, have sparse bright green-yellow petalless flowers, up to 3cm (2in) in diameter. 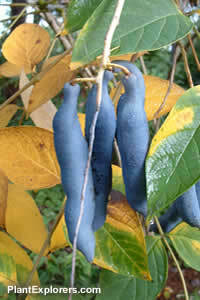 The fruit, up to 15cm (6in) in length and resembling fat bean-pods, turn dull metallic blue in the autumn. Decaisnea can make for a remarkable conversation piece in any garden. The common name 'Dead Man's Fingers' is a surprisingly apt description of what the over-ripe fruit looks, and dare we say, feels like. This is a beautiful plant in its own right, but it really shines as an annual source of excellent Hallowe'en decorations. For maximum freshness, please keep seed refrigerated in its original packaging until it is time to plant. Sow seed in containers in an open frame in autumn or spring. Maintain even, but not excessive, moisture. Grow on in any good garden soil in sun to part shade. Hardy to -15°C (5°F).